A defined, serum-free and xeno-free culture system optimized for the growth and expansion of hMSCs from a variety of sources: placenta (hMSC-PL), adipose-tissue (hMSC-AT), Wharton jelly (hMSC-WJ) and bone marrow (hMSC-BM). NutriStem® MSC culture system is developed specifically for the attachment, dissociation and freezing, as well as enabling long-term growth of hMSCs while retaining self-renewal and multi-lineage differentiation potential. Defined, serum-free, xeno-free reagents are essential tools for all human mesenchymal stem cell (hMSC) research having potential clinical applications. The NutriStem® MSC Culture System includes defined reagents ideal for translational research use. 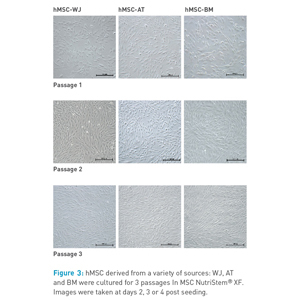 hMSCs cultured in serum-free, xeno-free MSC NutriStem® XF Medium show superior proliferation and self-renewal potential in comparison to serum-containing media and other serum-free media. In addition, hMSCs maintain their proper fibroblast-like cell morphology, tri-lineage differentiation potential, and demonstrate normal hMSC marker profiles and karyotypic stability over long-term culture. 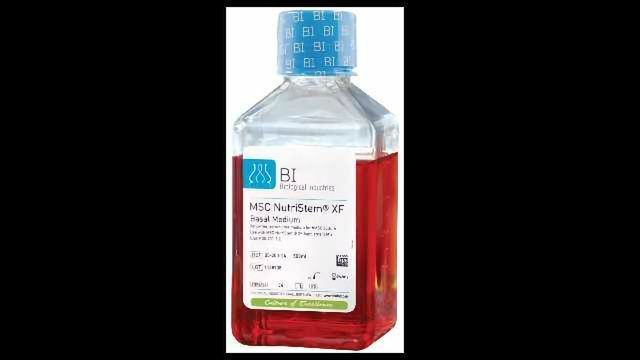 Cells cultured in serum-containing medium do not require an adaptation phase when transitioning to serum-free MSC NutriStem® XF Medium. hMSC from various sources (hMSC-PL, hMSC-AT, hMSC-WJ, hMSC-BM) can be efficiently isolated using MSC NutriStem® XF on pre-coated dishes. Addition of 2-2.5% human AB serum may be required for certain tissues. 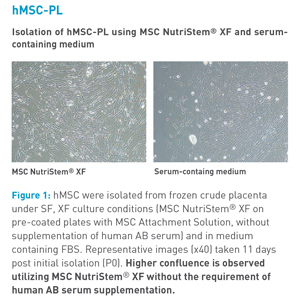 Using MSC NutriStem® XF for isolation of hMSC enhances purity of MSC populations in earlier passages and increases the number of hMSC in comparison to FBS-containing medium. 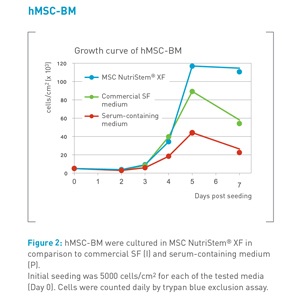 hMSC cultured in MSC NutriStem® XF exhibit a high proliferation rate and long term growth in comparison to competitors’ media (see figure 2). 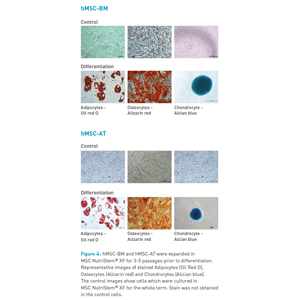 MSC NutriStem® XF promotes proliferation of hMSC from a variety of sources while maintaining normal fibroblast-like, spindle shape cell morphology (see figure 3). hMSC cultured in MSC NutriStem® XF maintain their trilineage differentiation potential (see figure 4). 3. Cai, Zhen, et al. Chondrogenesis of Human Adipose-Derived Stem Cells by In Vivo Co-graft with Auricular Chondrocytes from Microtia. Aesthetic plastic surgery 39.3 (2015): 431-439.